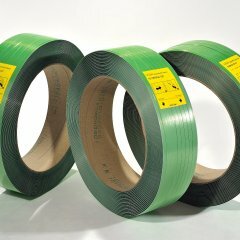 Polyester strapping, 8 – 25 mm (1/3” – 1 1/4”) wide, particularly suited for applications that require high tension and where there exists an elevated risk of shock splitting. 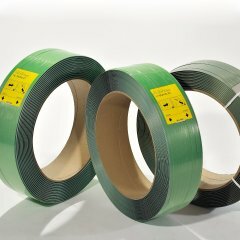 TYCOON® HighTension is suited for applications that require high strap tension and where there exists an elevated risk of shock splitting (e.g., wood and timber industry). 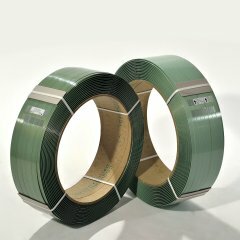 Furthermore, it is suited for sharp-edged products encountered in the metal or building supplies industries. Consequently, it guarantees troublefree manufacturing processes on fully automatic strapping machines.